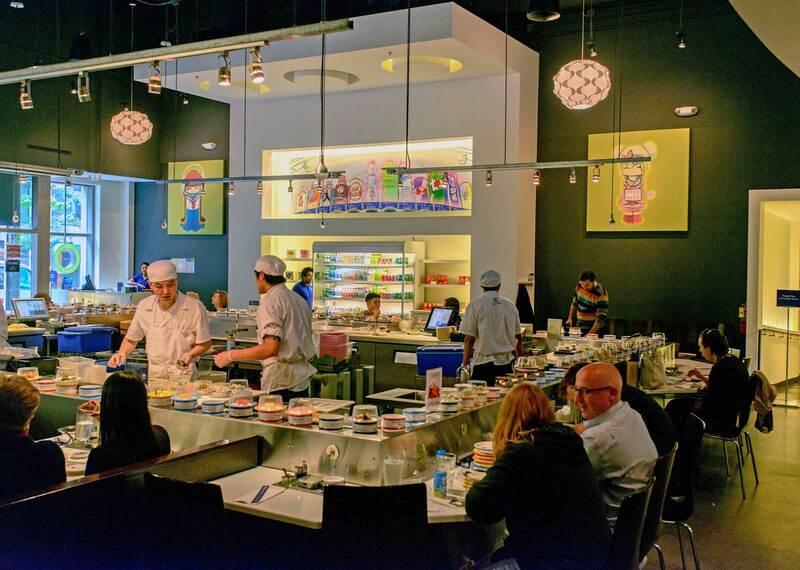 NOW: For his “repeat” Jean was welcomed into Blue C Sushi on 7th Avenue – of course – where he shouldered the popular sushi bar’s east wall for a revealing prospect of what was long ago the home and work site for the Anthony families home and bindery business. 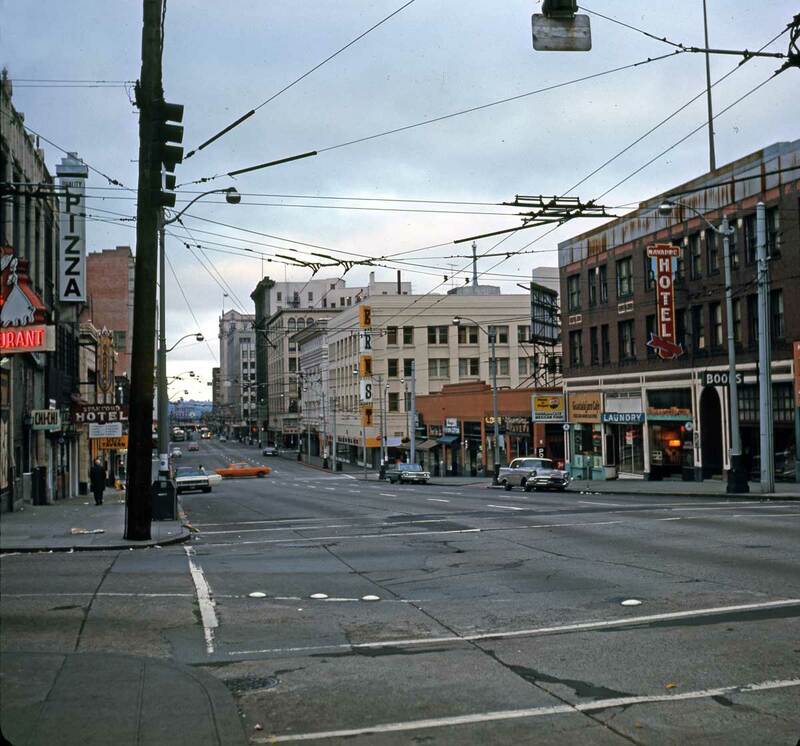 On the Sunday morning of June 30, 1963, Frank Shaw loaded his Hasselblad camera with color film, and climbed a narrow driveway off 7th Ave. between Pike and Pine Street approaching the center of Block 66 of the Denny Addition. 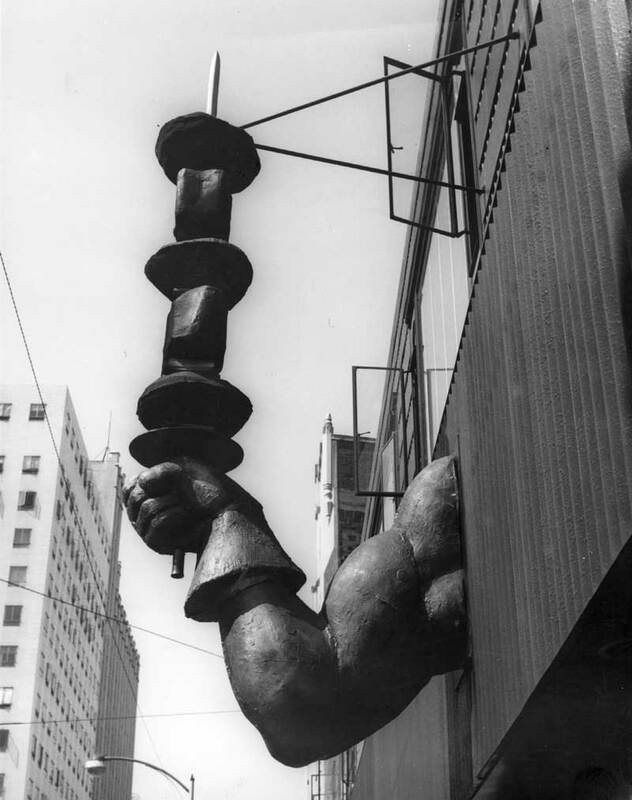 Although surrounded by hotels including the Waldorf behind him and above him the towering Art Deco landmark, the Roosevelt, (seen here across 7th Avenue), Shaw focused instead on this fading gray pioneer, for more than 70 years the clapboard home of the Anthony family. 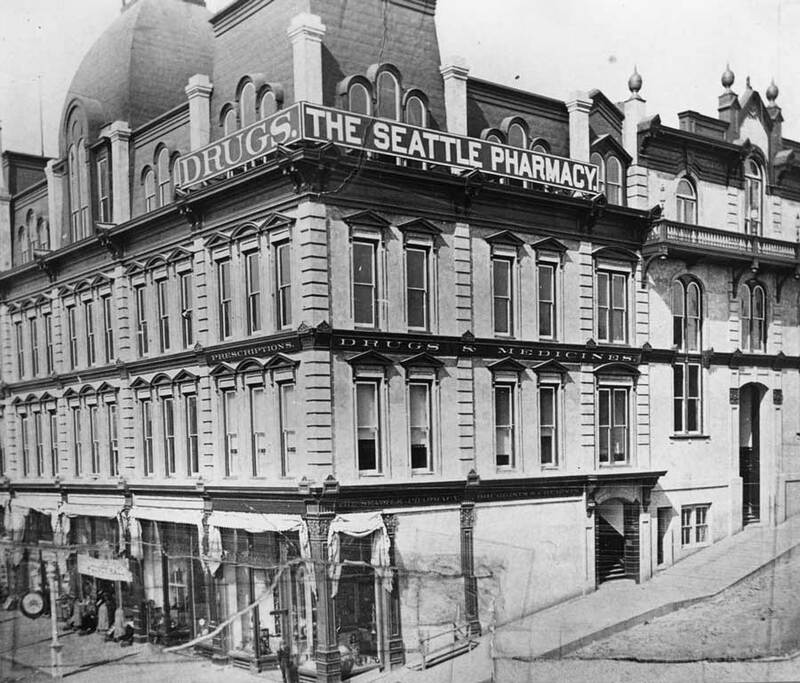 It was built ca.1887 on a 60×100 foot lot that the German immigrant Ferdinand Anthony purchased directly from Seattle’s “father-founder” Arthur Denny. The Frye Opera House ca. 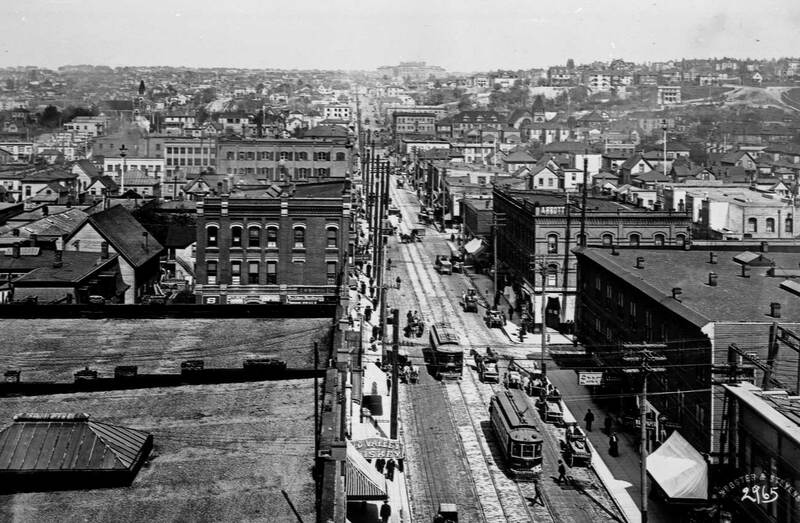 1887 looking northeast across the intersection of Front Street (First Ave.) and Marion Street. 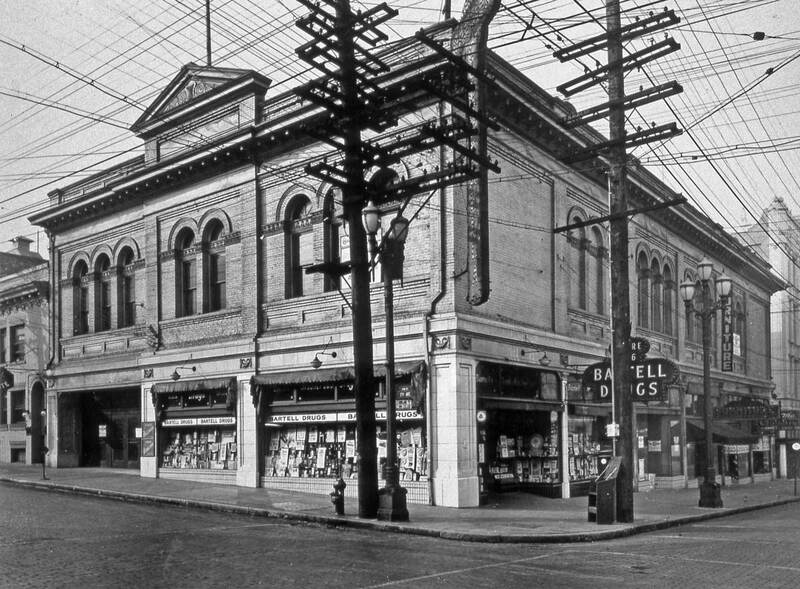 Anthony began his pioneer book binding business in the Frye Opera House in the early 1880s. Eventually the family business was moved into a long shed built for it behind their home. (Here the bindery is out-of-frame to the right, but it is included in two of the five transparencies of the home site that Shaw exposed this Sunday. We will attach them, with captions, following the text for this feature.) 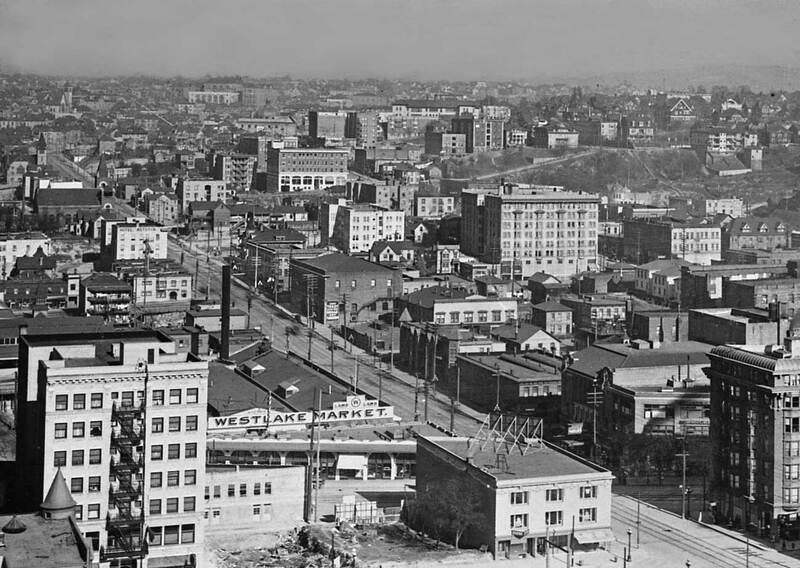 As his many surviving cityscapes confess, when Frank Shaw, a Boeing quality control inspector, was not out climbing with the Mountaineers, he liked to walk the city taking pictures of what he characterized for Bob Geigle, a friend at Boeing, as the “what is.” Shaw was a “realist” with his camera, who typically found something old more embodied than something new. 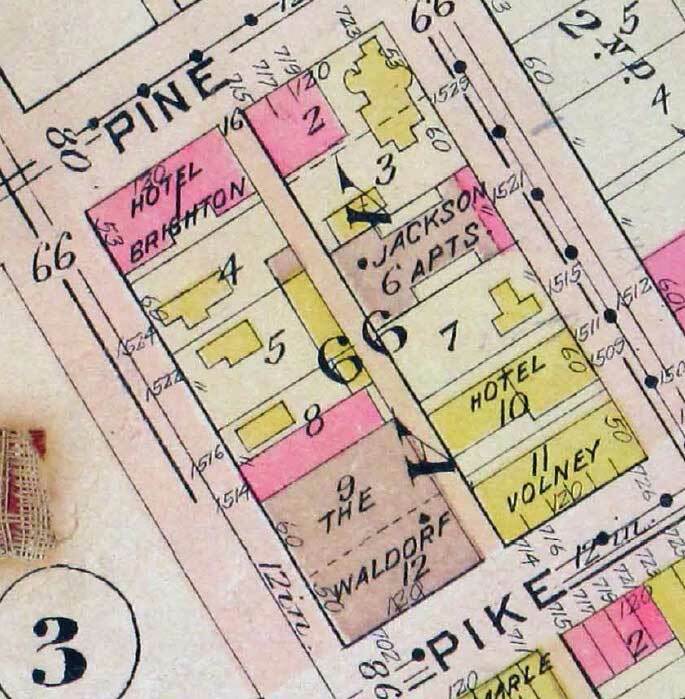 The 66th Block as colorfully recorded on the old faithful 1912 Baist Real Estate Map. 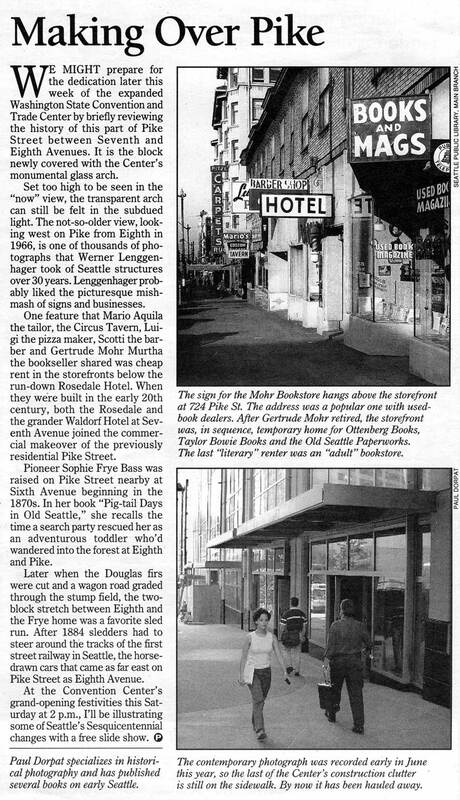 Lot 5 is the Anthony’s and their bindery is in the long yellow-caste shed running with the alley between Pike and Pine. The shed is between the home and the Jackson Apartments that face 8th Avenue. 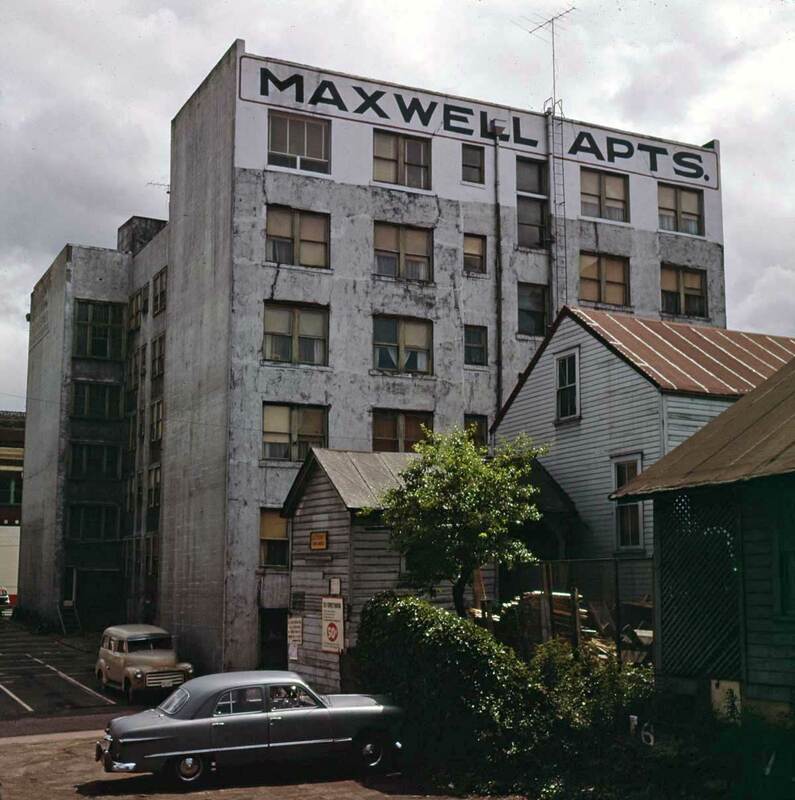 They were later renamed the Maxwell Apts, as we see them in Smith’s other photos of the site inserted here below the text. Capt. Jackson’s mansion is seen in footprint on parts of lots 2 & 3. We will include a feature on the Jackson Mansion below – but not directly below. A few of the “key-word” choices for the Jackson Apt. 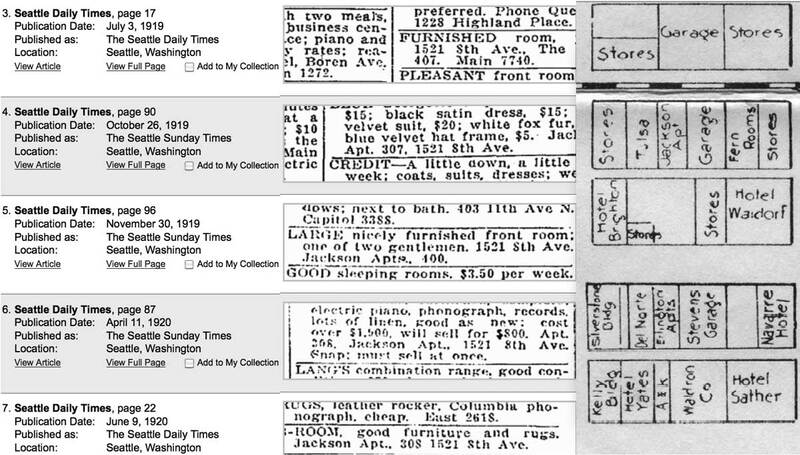 appearing in the Seattle Public Library’s web page opportunity to search The Times from 1900 to 1984. Beside it is a detail of the block from a 1925 commercial map, which consequently gives no footprint for the Anthony Home or industry . Robert Shaw consistently dated and named his negatives and transparencies. He did not, however, keep a photographer’s diary, and so we don’t know what he knew about the Anthony family – if anything. 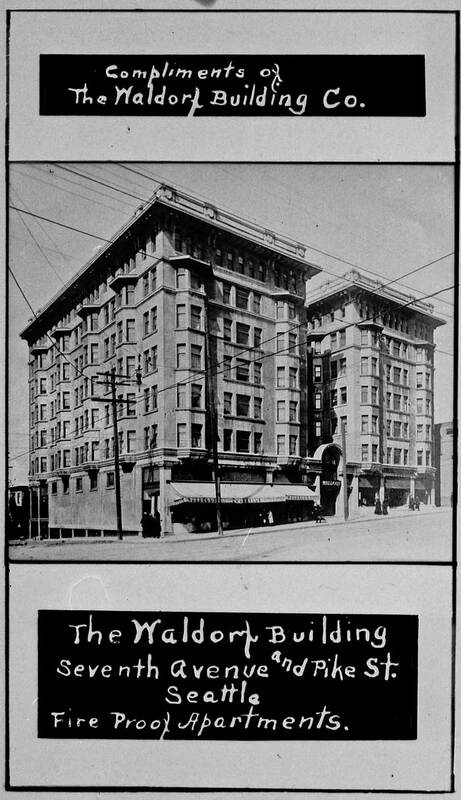 Following their father Ferdinand’s death in 1919, Robert, age 33, and his younger sister Julia continued to run the binding business, although Julia also gave 42 years to teaching in Seattle schools. Thru their many years on 7th Ave. Robert Anthony had denied a parade of agents with cash offers for his property, explaining that it “suited” him as is. Robert died less than half a year after Robert Shaw’s visit. 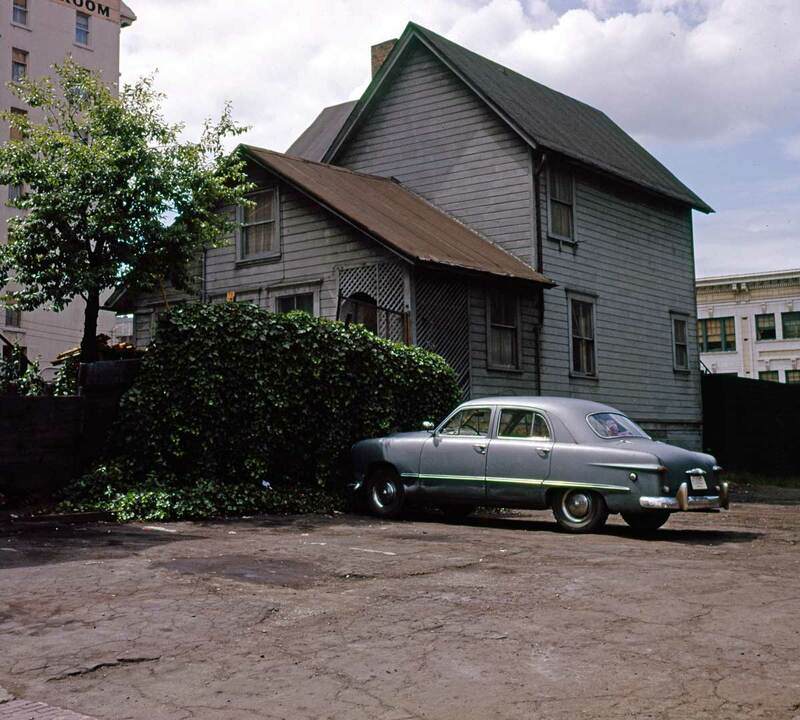 The Anthony “compound” was soon razed in 1964, at first for more parking. Julia passed in 1970. Anything to add, Paul? As always – almost – a few more samples from the neighborhood, illustrations and, this time, also four past features. Frank Shaw was an active member of the Mountaineers whose clubhouse was on Pike Street up the stairs from the sidewalk above the Caballero. 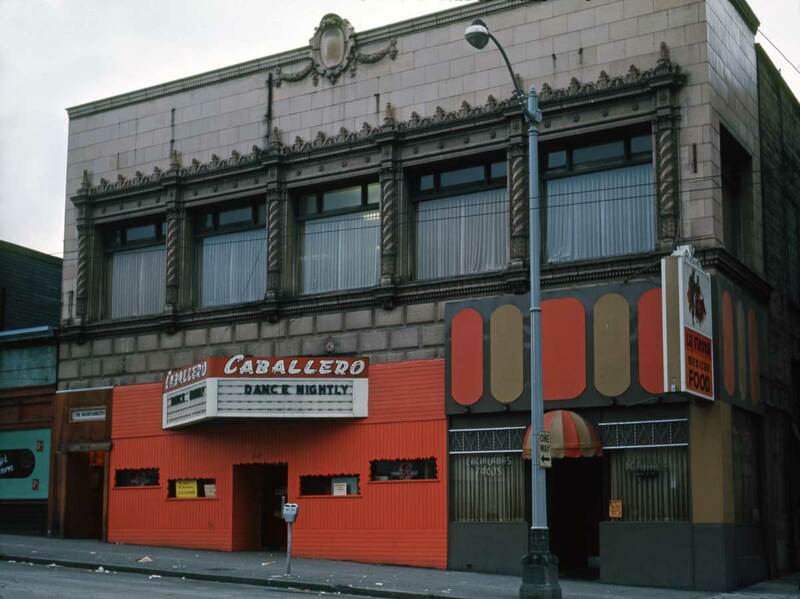 The slides that follow are of the Pike Street scenes near 7th Avenue that were most likely photographed during one of his visits to the Mountaineers clubroom. 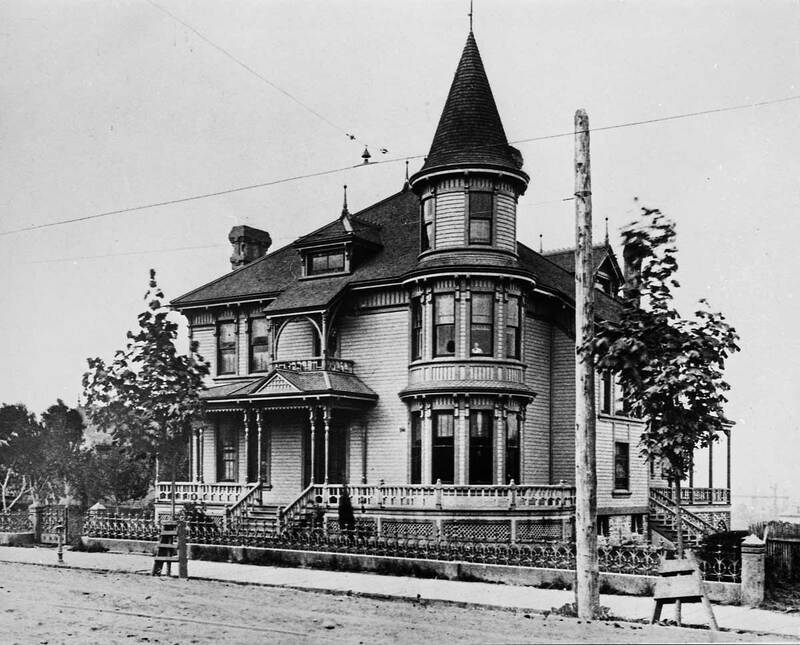 The history of Seattle’s big homes began in earnest during the 1880s boom. Moneyed families, including the Yeslers, began building oversized homes right in town next door to smaller bungalows. 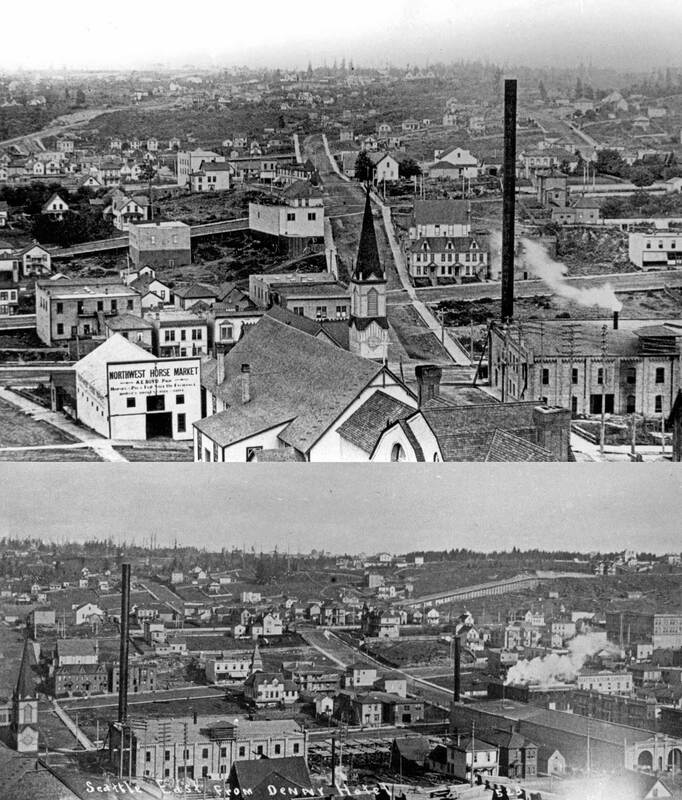 As the town quickly grew into a city, First Hill developed as an almost exclusive neighborhood of mansions. 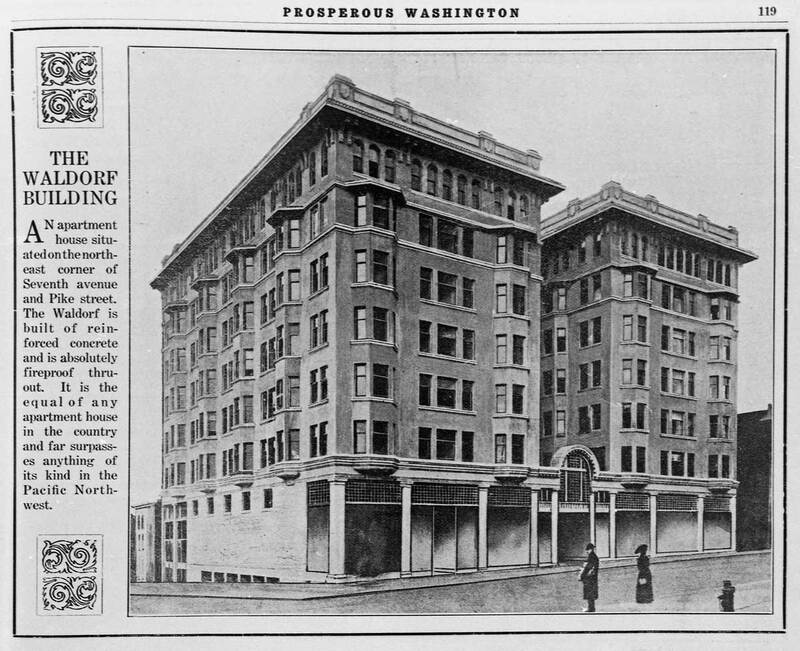 Later, the dispersal of First Hill society proceeded in many directions, including Lake Washington, Capitol Hill and walled-in enclaves such as Broadmoor and the Highlands. 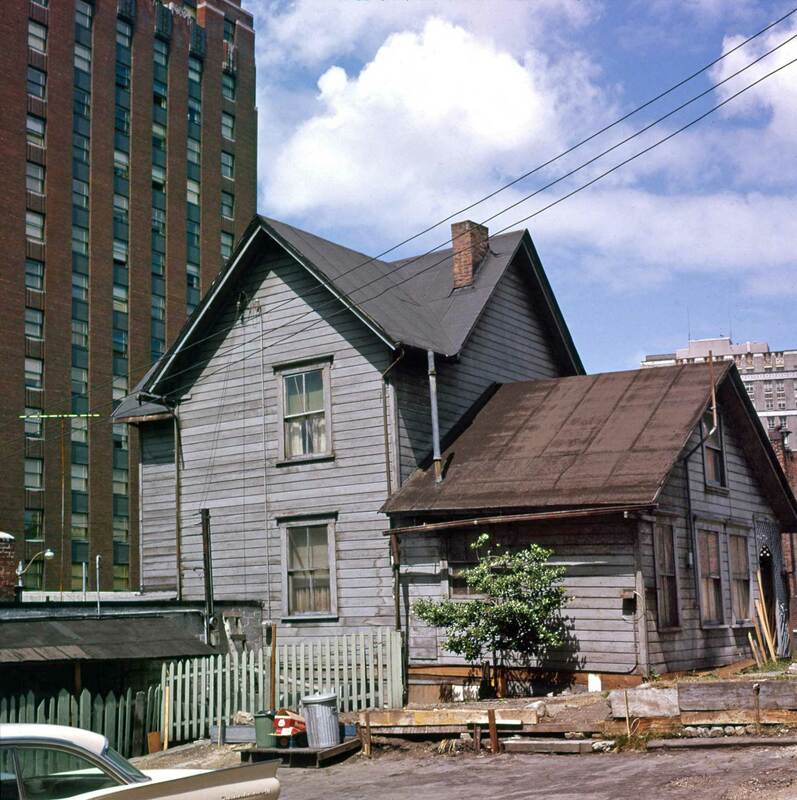 Today, there only a few surviving big homes on First Hill. Its transformation to apartments and clinics is long since completed. The D.B. Jackson home was an exception to the practice of the rich gathering in plutocratic enclaves. It was neither in town nor on the hill. 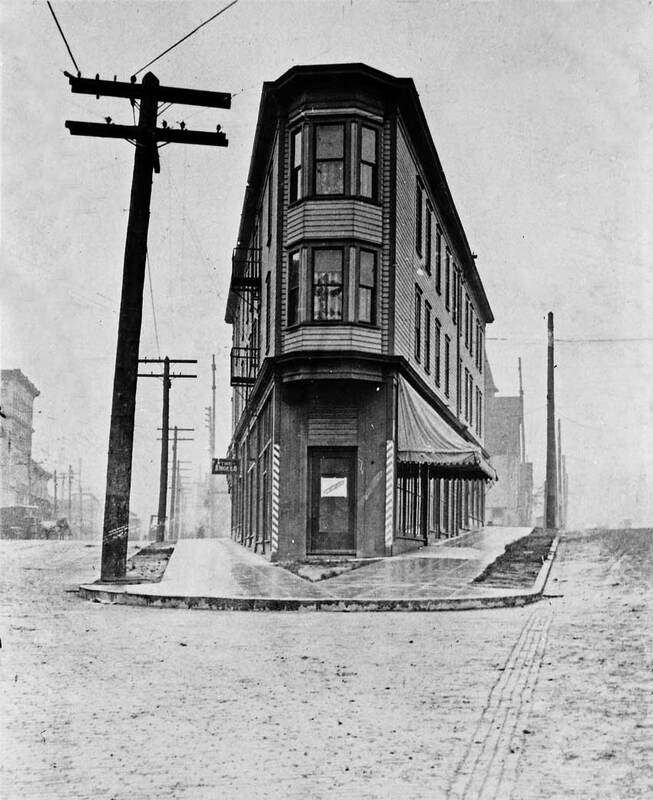 Sited at the southwest corner of Pine Street and Eighth Avenue, its construction in 1888 placed it at the expanding northern border of the city in a neighborhood lightly settled with workers’ homes and duplexes. Captain Jackson was a lumberman, working through the 1870s as manager of the Puget Mill Company’s fleet of tug boats. The Jackson family home at Port Gamble is preserved there. In 1882, Jackson formed the Washington Steamboat and Transportation Co. and won the mail contract for Puget Sound ports. This enlarged the so-called “Mosquito Fleet” of small steamers buzzing about the Sound. In 1889, Jackson expanded his operations into the very successful Puget Sound and Alaska Steamship Co. The Jackson big home a the southwest corner of 8th and Pine. 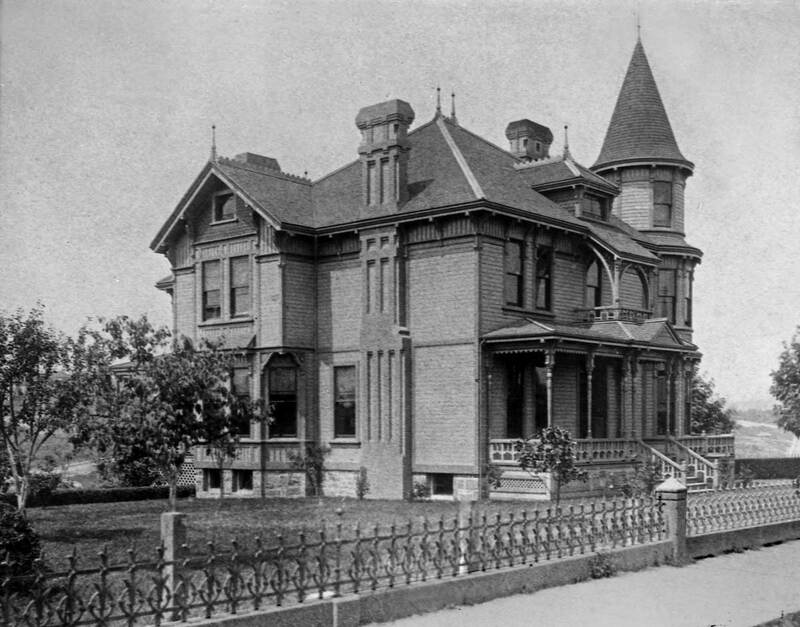 The Jackson big home was begun by Fred E. Sander, a local trolley promoter, in 1888, but it was the Jacksons that finished it. The Mansion was lavishly appointed with stained glass, hardwoods, plush carpets and frescoed ceilings. It had 14 rooms, and each with its own fireplace, but the captain had little time to enjoy it. He died in 1895. His wife, Mary, lived on in the big home for another 20 years before moving to Captiol Hill in about 1914. Nearly back-to-back, she was neighbors with the Anthony family for a quarter-century. Mary Rowell Jackson died in 1927 at the age of 92, leaving 20 grandchildren and 22 great-grandchildren, including Sen. Dan Evans. 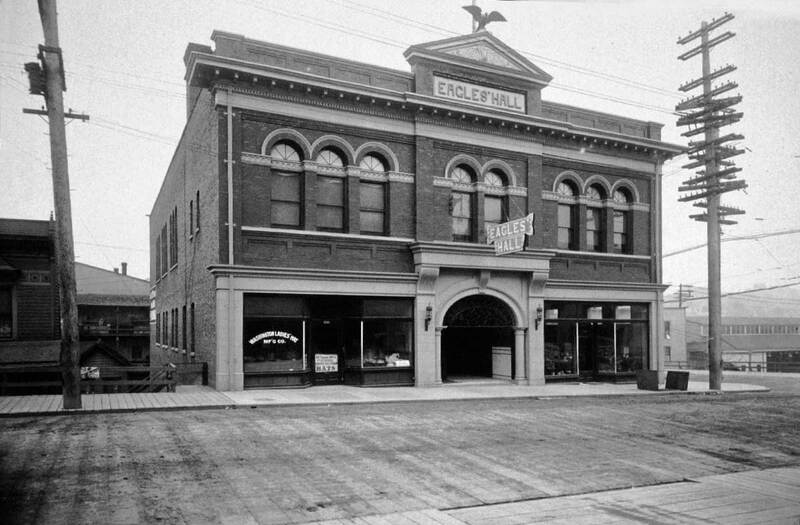 In 1904, after renting space from the Masons, the burgeoning Eagles moved into their own hall at the southwest corner of Seventh Avenue and Pine Street. In the less than five years since their founding, they had added more than 1,000 members and enough cash to purchase the comely hall and crown Aerie No.1 with an eagle. Part of the reason the Eagles grew at a record rate was because so many of them were entertainers who were always on the move. They also dropped the hazing. John Cort, the first president, explained: “We want to make life more desirable by lessening its evils and promoting peace, prosperity, gladness and hope.” Theirs was a politics of populism and patriotism. At one time or another the order promoted workers compensation, Mothers Day, old-age pensions and, briefly, a guaranteed annual income. Eagles after its conversion into another Bartells. 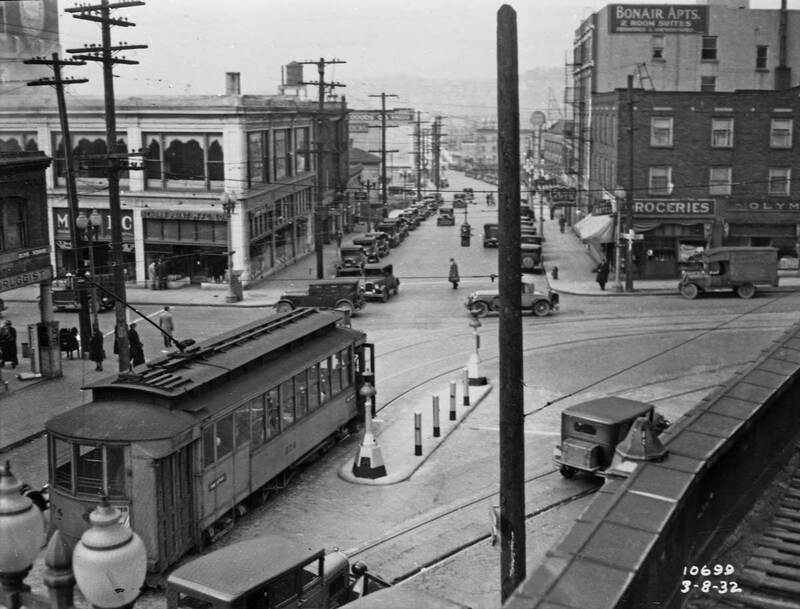 THE ‘Y’ OF HOWELL AND OLIVE LOOKING EAST FROM 8TH AVENUE. Little block 28 of Sara Bell’s Second Addition is one of those pie-shaped oddities that offer relief from the predictable space of the American urban grid. The buildings on them seem to put on a show – sometimes, like here, pushing their faces into the flow of traffic. 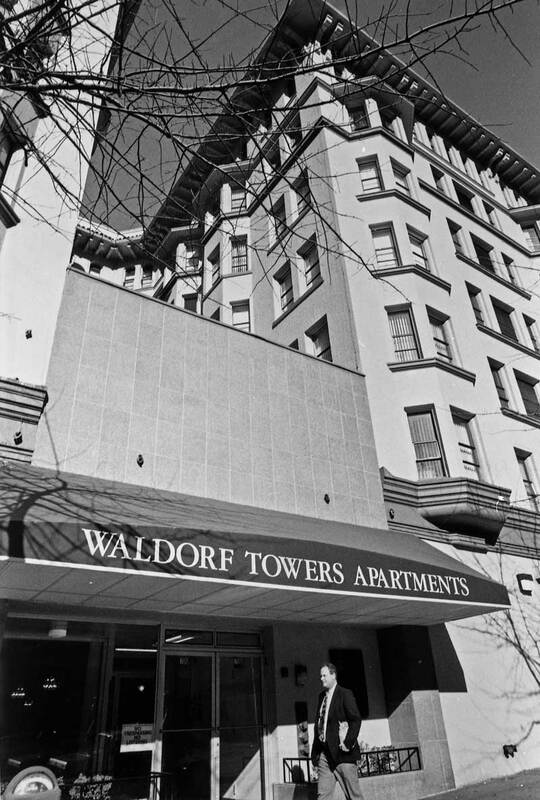 This mixed-class (retail and apartment) structure thrusts its forehead into the five-star corner of Olive Square. 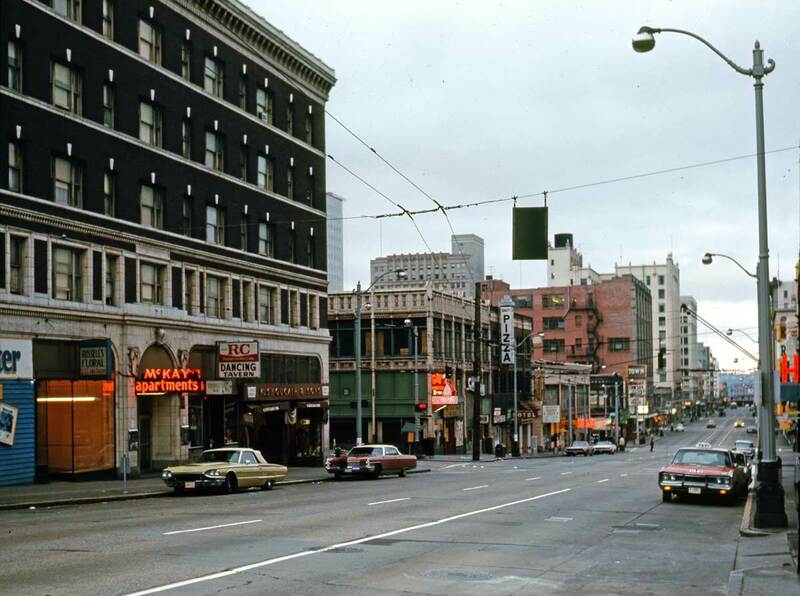 Here Howell Street, on the right, originates from the intersection of Eight Avenue and Olive Way. 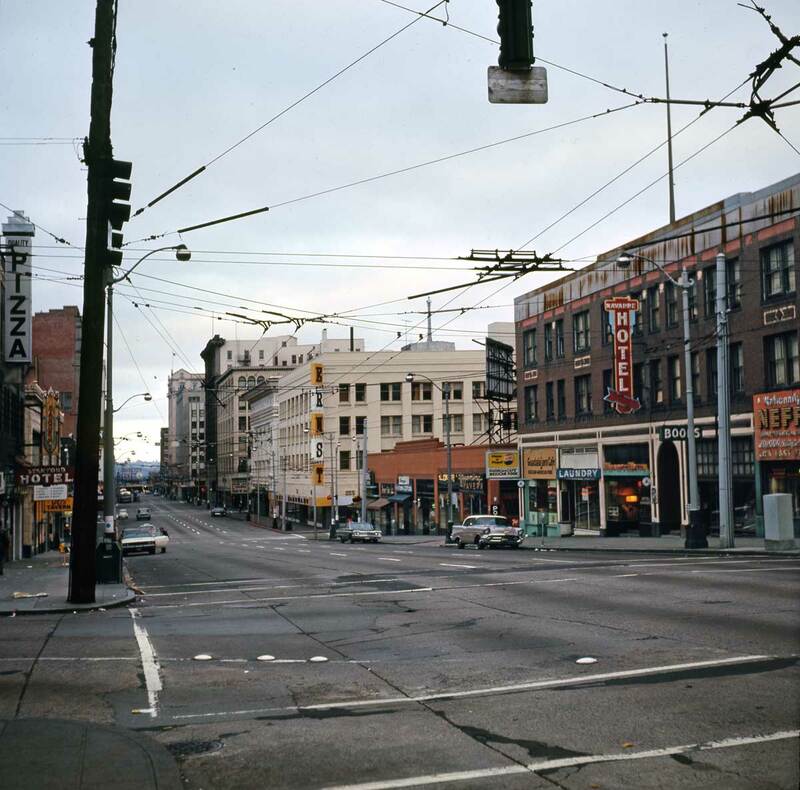 After Yesler Way running west from Broadway, Olive is the second odd tangent that enlivens the otherwise monotonous street configuration of Seattle’s central Business district. 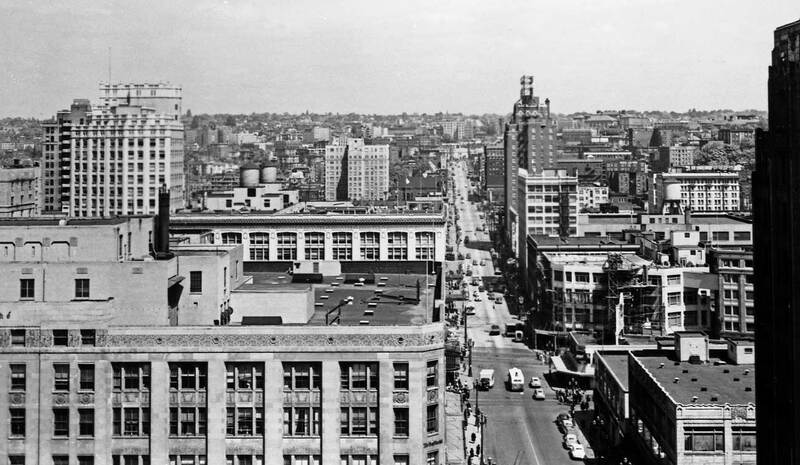 The scene was probably recorded by the Public Works Department’s photographer, James Lee, which may explain the photograph’s enigmatic purpose as a record of something having to do with public use rather than private or architectural glory. Still this vain little clapboard is a pleasure – although it may be an idle one. The bright sign taped to the front door is a real-estate broker’s inquiry card. The only other sign showing is hung on the left over the sidewalk on Olive way. It is for the Angelo, the residential rooms upstairs. Appeared first in Pacific on July 8, 2001. 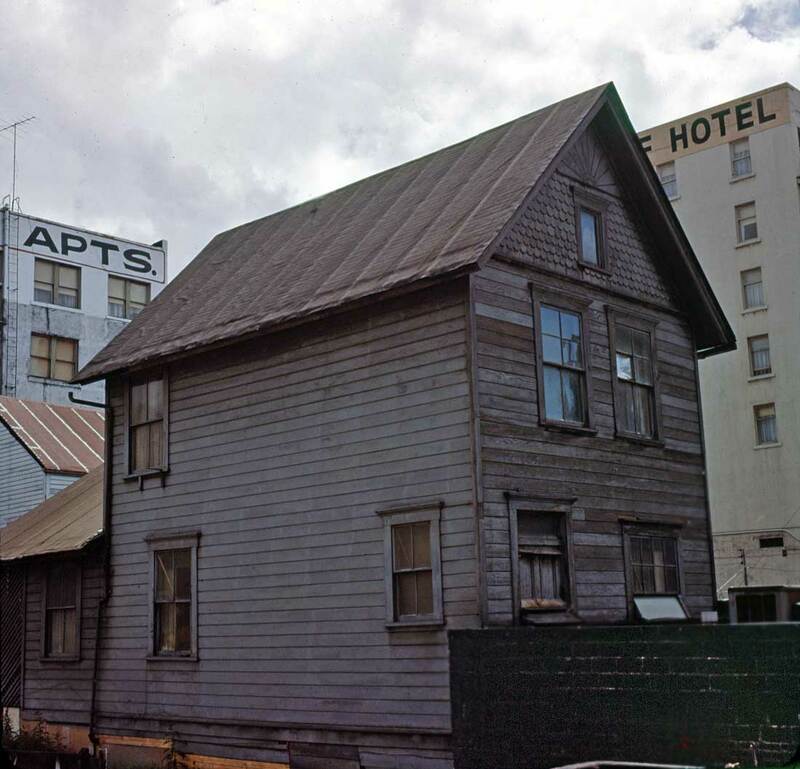 ALL BUT 2 of the 7 SUBJECTS that FOLLOW, INCLUDE AT LEAST A GLIMPSE of the WEST FAÇADE of the ANTHONY FAMILY HOME mid-block on the East Side of Seventh Avenue Between PIKE & PINE STREETS. This is a TEST – WITHOUT THE ANSWERS. FAMILIAR as you are by now with the ANTHONY HOME, we are confident that if you SEEK YOU WILL FIND!